Turboview – allows users to quickly thumb through monitoring station data from all sites in that project. Graphs always show the last two weeks of data, allowing users to keep an eye on station daily trends. Line Graphs / Scatterplots – Typical time series data plotting functions that allow users to graph reports and see multiple sites and site types plotted against each other. I.e. flow monitoring stations together with rainfall monitoring stations; or, rainfall together with a drainage water quality monitoring station. 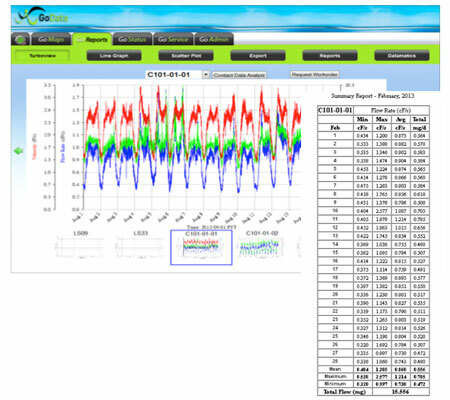 Data Export – Allows the user to export small or large amounts of time series to be archived and/or used for other functions such as importing into a hydraulic model. Reports – The Reports tab in this section allows users to create custom tabular reports based on their specific data types. As an example, monthly or annual report tables can quickly be generated for use in reporting to regulatory agencies. A report including flow rate max, min, avg, and totalized flow over time, is just one specific example of a tabular report completed with just a click of a button.